*All stats are courtesy of Understat and WhoScored, while the PPDA article was retracted from Stats Bomb. In this article I will explore certain characteristics a first division Spanish club should look for in order to attain a comfortable middle class rank, or similarly, a mid-table position. This would include the league positions from 7th-11th, considering the lower league positions are considerably close to the relegation zone, for which such league standing would not be considered a comfortable middle class rank, but more like a lower class rank. The teams occupying these standings are Eibar, Girona, Celta, Getafe, and Real Betis. For the sake of the comparison of these teams’ different phases that will be broken down in this article, I have both grouped together and separated key characteristics that make these teams successfully compete at such a high level in Spanish football with a significantly inferior budget. These teams use different resources efficiently to gain competitive advantages both on the field and off of it. Below, aside from breaking down many of these teams’ characteristics, I will turn to tactical and data analysis to figure out what teams that look to attain mid-table positions should look to incorporate to compete at this level. More specifically, I will break down what certain styles of play should be expected from certain roles and positions in regards to goals, expected goals and assists, shots per 90, and other meaningful metrics, how teams with given characteristics should defend based on these 5 teams’ previous defensive approaches, and ultimately, if teams should prioritise high pressing, aerial duels, passing, set-pieces, or crossing in their quest for a middle class status in Spanish football. Should these teams prioritise volume passing? The answer largely depends on the system implemented by the manager. For Unzue and Quique Setien, for example, playing with the ball seems to be a top priority. Only topped by powerhouses Real Madrid and Barcelona, Celta rank 3rd in Spain with 523 passes per game, while Betis are 4th with 519.2 (WhoScored). However, attaining these league positions with low-volume passing is most definitely within a teams’ reach. As the graph shows, Getafe and Girona rank 20th and 15th respectively in passes per game, but both still hold better league rankings than most teams in the league. Eibar aren’t really big fans of volume passing either. They try to be as direct as possible, always looking to find crosses or passes into the space behind defensive lines. In fact, besides Getafe, Eibar have the most short-passes intercepted per games in Spanish football (WhoScored). Statistics show Eibar logically favour long-distance passes, as they are too the team in Spain with most accurate long balls per match with 44.4 (WhoScored). Eibar and Girona are the two teams that like to cross the most out of these 5. Eibar ranks first in the league with 6.8 crosses per game, while Girona rank 4th with 5.4 crosses per game (WhoScored). Eibar also lead the league in assists from crosses per 90, with a team total of 0.5 every match. (WhoScored). As the table shows, Celta, Getafe, and Betis rank either on the 50th percentile or below it, pointing out that they don’t prioritise crossing much. An interesting factor, however, is that a significant amount of Celta’s assists come from out wide, with Pione Sisto being the main protagonist, resulting in an xA (expected assists) over-achievement that will be further illustrated in the section The Wide Chance-Creator. With Maxi Gomez on the end of the teams’ crosses, Unzue should utilise more crossing from Sisto and Mallo to feed the Uruguayan target man. This section vaguely refers to set pieces as the combination of direct free kicks, set pieces, and corners. Set pieces can be of vast importance for some of these teams. In the corner department, Getafe are quite brilliant. They rank 2nd in the league in accurate corners per match with 2.9 (WhoScored). For both Getafe and Eibar, set pieces are even so important that they account for around 1/4th of their total goals in the competition. More specifically, 7 out of 32, or 22% of Eibar’s goals have come from set pieces. Meanwhile, Getafe have recorded 9 of their 31 goals from such situation, accounting for an astonishing 29% of the teams’ total goal tally in the league (WhoScored). For this purpose, it’s crucial for these teams to have players that can successfully get on the end of crosses. Primordially, these teams benefit from having the classic target man striker both in set pieces and open play. This profile of player can score from difficult locations, possess great aerial presence and finishing accuracy, can hold on to the ball with their back facing goal, and regularly test the goalkeeper no matter the match. This leads us into the next section of the article, Specific Roles Mid-Table Teams Should Look For. The good thing about mid-table La Liga sides is that the classic target man striker is useful both in the positionally versatile and defensive systems. Oddly enough, Eibar don’t have a target man striker of these characteristics, even though their game is perfectly suited for one. Even though Eibar would hugely benefit from one, they seem to have their goal tally properly divided among the squad. Contrary to Eibar, most of Getafe’s goals come from three players, who make up over 2/3rds of the teams’ total goal tally. The only outlier would be Betis, who vouch for more versatile and free-flowing strikers. Now, after statistically analyzing the successful ‘target man strikers’ in mid-table La Liga, the three best examples are Maxi Gomez, Stuani, and Angel. These 3 players set the standard for target-man strikers in middle class La Liga teams. Their similarities can also be illustrated with player radars. This chart and their comparative Understat radars show the similarity in each striker’s end-product. From this, we can conclude that, as of 26 fixtures, the striker for a successful mid-table team in Spanish football should average around 2.5 shots per 90 minutes, at least .5 xG per 90, around 12 goals, at least 2 goals from set pieces, which make up at least 20% of the strikers’ non-penalty goals, and a total xG from open play of over 7.00. For comparison purposes, I chose to examine the last 2 partnerships, because they represent more similar duos that have yielded success, meaning that their production could be put into representative numbers for other aspiring mid-table teams to help guide themselves into what numbers they should seek from their striking partnership. Maxi Gomez and Stuani both are target man strikers. Around ¼-⅓ of their goals come from set pieces. Similar in expected goals (11.29 vs 12.56), same in goals, and similar in shots (2.53 v 2.58). Portu and Iago Aspas play the versatile and direct attacker role. While Aspas’s numbers are much more elevated because he is one of the best in the league, this type of team needs this profile of player. While Portu is more clinical in front of goal (11 goals on 1.53 shots and with an xG of 6.71), Aspas produces to a higher volume. Portu scores 30% of teams goals (11/36) while Aspas scores to 37% (16/43) of Celta’s goals (Understat). When examining the different creative players in these 5 sides, one role that can be attempted to be mimicked would be the acquisition of a player talented enough to whip in accurate deliveries from out wide during difficult match scenarios, consequently leading them to overachieve in xA (expected assists) from wide areas of the pitch. These players could either be full-backs, wing-backs, wingers or other players/positions operating in wide areas. In the case of Celta and Eibar, their xA overachievers from out wide are left-back Jose Angel and left-winger Pione Sisto. Both have recorded a high number of assists, 7 and 9 respectively. However, it’s not only the amount of assists they have recorded that makes them valuable, but also their ability to constantly create chances and overachieve in assists for their teams. For reference, Sisto has recorded 9 assists from just 3.6xA, meaning that he is overachieving in assist numbers by 5.4 xA. Meanwhile, Jose Angel has 7 assists from just 3.88 xA. In other words, Sisto has 5 more assists than expected and Jose Angel has just over 3 more than expected. Eibar and Celta can both rely on Jose Angel and Sisto to feed their forwards with constant deliveries from the left flank, many of which result in clear-cut chances and goals, even from congested areas of the pitch and difficult situations. Their regularity in chances created is justified by Sisto’s 1.26 KP90 and Jose Angel’s elevated 2.02 KP90. As the previous and next assist will show, most of his assists come from an initial acceleration towards the area of action, followed by a deep cross into either the heart of the box or the far post. He dribbles past his first opponent before whipping in a delivery into the far post. Although complicated to see, Sisto’s delivery was scored with a half-volley. Bar Betis, middle class teams rely heavily on their mid- and low- block strategies. Three systems were the most used by these 5 teams, including the classic 4-3-3, two variations of ‘5-at-the-back’ systems, and the most used, the 4-4-2. Unsurprisingly, the 4-4-2 is the most common formation used among these 5 teams. For obvious reasons, the formation was regularly used by Celta, Eibar, and Getafe: it involves a basic symmetrical shape, each position can be easily molded into highly specialized roles, it facilitates defensive compactness, it can favor wing play while providing two finishing options in the box, and lastly, it’s a relatively universal system, which can speed up player adaptation and improve both system and role understanding for players. Eibar implement a less structured mid-block than Getafe and Celta, which is largely due to the amount of intense pressing the Basque team conduct. Similar to Ernesto Valverde’s 4-4-2 with Barcelona, Eibar’s central midfielders act ball-oriented. When one steps up to put pressure on the ball, the other 3 midfielders retrieve to guard the vacated space. Meanwhile, the forwards look to screen any horizontal or back pass to the rival full-backs, deep midfielders or centre backs. Although their pressing is the most intense in the league according to PPDA metrics (will go further into detail in the next section), Eibar player’s prioritise staying on their feet rather than committing to tackles to prevent from being overcome easily. As of March 2nd, they are 13th in tackles per game with 17.2 (WhoScored). Their synchronised pressing movements in defence lead to vast turnovers, many of which are high up the pitch, which helps them create chances and catch opposition rivals in dangerous situations. This is supported by them leading the league both in interceptions (15.3) and in PPDA (7.42) (WhoScored / Understat). Another area that Eibar excel in is in the air. They favour a crossing and physical style of play, and invite rivals to cross into their box as well. Logically, this would lead one to induce that they are very good in the air. And, as mentioned, they are precisely the side that participates in the most aerial duels per game with 37.1, as well as being the team that wins the most aerial duels per game, with 19.3 (WhoScored). Although the second statistic might merely be a result of the first, Eibar’s aerial duel numbers should not go unnoticed. Again, they are very good in the air. Compared to Eibar’s 4-4-2 mid-block, Getafe operate a far more organised block. They like to maintain their two lines of 4 compact, attempt to orient rival possessions towards the wings, the central midfielders perform zonally, not man- or ball-oriented, and one of the two forwards usually drops out to help overloads in defence. As mentioned, both blocks have their similarities and differences. Getafe like to commit to tackles more than Eibar, ranking at 8th in the league with 19.1 (WhoScored). They are also significantly worse in the air, given they rank relatively highly (7th) in the quantity of aerial duels per game yet are very unsuccessful in such field, ranking 14th with 13.7 successful aerial duels per game. They also don’t press very high up the pitch. Similarly to Eibar, however, Getafe are quite frequent with interceptions, ranking 6th in the league with 13.2 (WhoScored). At the start of his managing career, Unzue vouched for a positional play based 4-3-3. Although some core principles from this style remain in the team’s identity today, he has adapted a more effective 4-4-2 that seems to suit his players accordingly. Having said that, he often turns to the 4-3-3 in moments of situational adjustments. Celta operate two very synchronized lines of four, with the primordial structural responsibility of maintaining the square created among both centre backs and central midfielders. They too tend to orient their rivals towards the wing in the middle of the pitch. As was just mentioned, Celta constantly shift to a 4-3-3 mid-block. While creating a less compact block, the 4-3-3 allows Iago Aspas and Sisto to play high and out wide, giving space for Hugo Mallo to overlap and for Johnny to operate in the half space. This system also eases their fluidity in possession, mainly when playing out of the back, which explains why Unzue likes to turn to the 4-3-3 when the team seems stagnant with the ball. As soon as Real Betis hired Quique Setien, Spanish football fans knew the 4-3-3 was coming to Seville, and not to Sevilla FC. More like a 4-5-1 mid-block at times, the defensive base consists of maintaining a narrow back four, having at least two central midfielders to occupy the central axis, and attempting to create 2v1s in wide areas against rival wingers or fullbacks. Out of these 5 teams, based on goals conceded and defensive strategies, it’s safe to say that Betis are the worse team defensively. They compensate for it though, as they are free flowing going forward and always manage to score many goals per game. If I were a manager training to attain a middle class rank in La Liga, I would not choose to implement or emulate Setien’s defensive system. Other systems seem are more suited for long term results with this level of players. Out of these 5 teams, the side that’s most commonly known for playing with 5-at-the-back systems is Pablo Machin’s brilliant Girona. Depending on the rival, they shift from a 5-3-2 to a 5-2-3. When they want less aggressive pressing and more defensive compactness in the central axis, they commence with a 5-3-2. Every players’ roles are highly specialised, and every player understands their role to perfection. Usually one midfielder conducts man-oriented presses alongside both forwards. As mentioned, they shift to a 5-2-3 whenever they want to turn to more aggressive pressing. Here is Girona using this risky system against Real Madrid. Against Real Madrid, Girona aligned a 5-2-3, yet actually conducted a 5-1-4 mid-block with the three forwards and 1 central midfielder operating man-oriented, with the other centre mid functioning zonally. Any pass to the rival full-back was used as a pressing trigger. In response to his poor defensive results, Setien has recently tried a 5-3-2 system. The triangle in the middle is in constant rotation, so sometimes it’s a 5-3-2, other times it looks like a 5-2-1-2. Both wide central defenders press the space in between Betis’ defense and the midfield, while the middle central defender operates as a sweeper. Now, a statistical measure of these 5 teams high pressing intensity in regards to the rest of the league. PPDA is not concerned on whether a player completed a pass or not, but rather the amount of pressure that the defending team puts on the opposition when they possess the ball (Trainor, 2014). The lower a team’s PPDA metric is, the higher they press. However, for this article, I have decided to create a graph using the team’s PPDA rank compared to their actual league positions, to see if there was any correlation between the two, and furthermore, to generally show the importance of these team’s high pressing strategies. 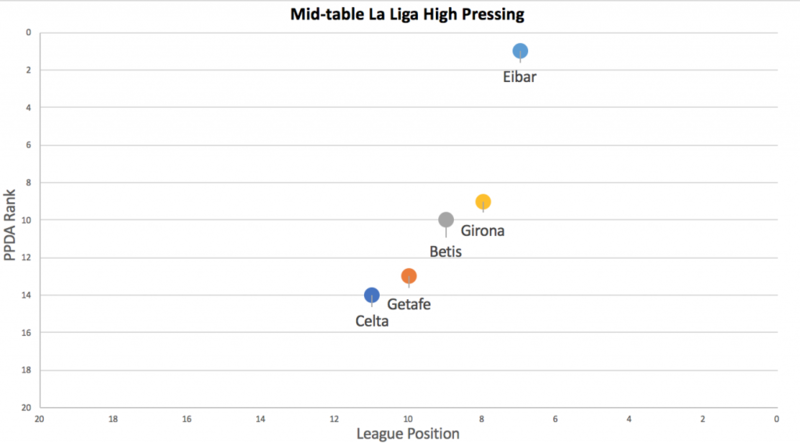 As the graph shows, Eibar press the highest in the league, while possessing the 7th league ranking in La Liga. More representative, the other 4 teams ‘seem’ to have a certain relationship between their PPDA rank and their league rank. From this we can conclude that middle class La Liga teams should focus in excelling in other areas, while having some relatively average high pressing strategies. We can also conclude that Eibar are the outlier, and while their levels of high pressing are obviously attainable with low resources, teams seeking for these spots should neither attempt to replicate it nor encouraged to do so, since Eibar being first in the PPDA ranking only ranks them 1 league position higher than 9th PPDA ranked Girona. While stating that there is a direct relationship between high pressing and league standing is ridiculous, the statistics show that teams remaining near the 50th percentile in the PPDA metric can definitely achieve a comfortable middle class status, given that this season, it has proven to be enough for 4 out of these 5 teams. Implement a 4-4-2 mid-block with one man-oriented and one ball-oriented CM. It would be less like Getafe’s, and more like Eibar’s. Have good enough pressing triggers and strategies to be over or around the 50th percentile in PPDA metrics. Implement a direct style of play, with a good mix of short and long passes. Seek for a target-man striker that can produce 2.50 Sh90, at least .5 xG90, around 12 total goals, of which at least 20% of them originating from set pieces, and a total xG from open play of over 7.00. Try to find a player with the ability to overachieve in xA from out wide. Although many of these teams excel in one or more given areas, the key to achieving such status is the balance among the team’s characteristics. The team does not to be the best in the league in high pressing, or lead the league in passing, as long as they learn to properly balance their extremes with other phases of the game, they will be able to compete at a mid-table level in Spanish football.